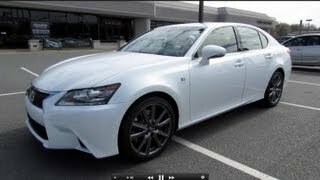 Lexus will unveil all-new Lexus GS350 F-Sport 2013 at the SEMA 2011 in Las Vegas on 1st November. 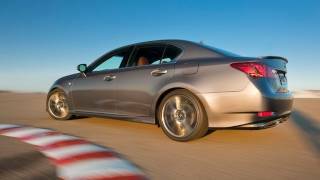 As with the GS350, the GS350 with F SPORT package is powered by an advanced 3.5-liter V6, with four cams, and four valves per cylinder and dual Variable Valve Timing with intelligence. At 306 horsepower, the engine propels the car from 0-60 mph in 5.7 seconds. 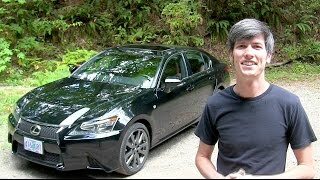 TORRANCE, Calif., Oct. 25, 2011 – Lexus will reveal the all-new 2013 GS 350 mid-size luxury sedan with F SPORT package at the 2011 Specialty Equipment Market Association (SEMA) Show in Las Vegas. The Lexus press conference to reveal the 2013 GS350 with F SPORT package will take place on Tuesday, Nov. 1 at 1:30 p.m. PDT at the outdoor Lexus exhibit tent, located between the Central and South Halls of the Las Vegas Convention Center.Following the press conference, media will have an opportunity to experience track rides in the all-new GS 350 with F SPORT package. The GS 350 with F SPORT package will be on display at the Lexus tent from Nov. 1 – 4.JT Grey Racing Lexus LX 570 Team driver, Joe Bacal and race car driver, Scott Pruett will be on hand signing autographs on Tuesday, Nov. 1from 10:00-11:00 a.m. and 12:00-1:00 p.m., respectively, at the Lexus tent. Joe Bacal will also be available to sign autographs throughout the day on Nov. 2. Building on the excitement of the fourth-generation GS350 which was revealed at Pebble Beach in August, the GS 350 with F SPORT package was designed to engage driving enthusiasts with factory engineering and the ability to take performance to an entirely new level.Unique to the F SPORT package will be aggressive 19-inch wheels, F SPORT-tuned Adaptive Variable Suspension (AVS), thicker anti-roll bars, bushing changes, and new larger front brakes with high friction pads.In addition, rear-wheel drive (RWD) models will be equipped with 19-inch staggered width wheels and Variable Gear Ratio Steering (VGRS). Inside, the all-new package also features a sporty attitude with a new 16-way power driver’s sport seat, unique interior design treatment and available F SPORT exclusive Cabernet Red leather interior. 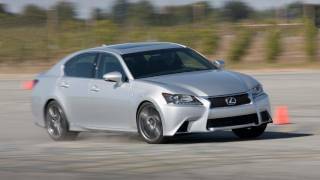 As with the GS 350, the GS 350 with F SPORT package is powered by an advanced 3.5-liter V6, with four cams, and four valves per cylinder and dual Variable Valve Timing with intelligence. At 306 horsepower, it is one of the most powerful base engines in the segment, as well as the only one with both port and direct injection. It propels the car from 0-60 mph in 5.7 seconds and at the same time, fuel economy has been improved. An optional electronically controlled all-wheel-drive system is designed to enhance traction in a variety of driving conditions.The system can vary front-to-rear torque balance from 50/50 to as much as 30/70, depending on driving conditions, for exceptional control. The new platform has been designed to be more rigid.Engineers conducted extensive platform testing, ultimately increasing the number of spot welds and adding laser welds in very specific locations. The track, wider by almost two inches, works in combination with a revised suspension design to help ensure a more solid stance and superior cornering performance. The GS 350 with F SPORT package will offer an optional newly developed Lexus Dynamic Handling (LDH) system with Dynamic Rear Steering (DRS) for those seeking more agility.This leading edge platform technology offers Lexus’ first integration of DRS; Electric Power Steering; and Variable Gear Ratio Steering.Monitoring vehicle speed, steering direction and driver inputs, the system calculates the optimum angle for all four wheels.LDH helps to optimize the vehicle slip angle. Using VGRS in the front and DRS in the rear, the system can independently manage both front and rear wheel steering angles to help improve turn-in response, rear grip, vehicle control and overall agility when cornering. The latest generation of Lexus’ unique Vehicle Dynamics Integrated Management system coordinates Lexus Dynamic Handling; the Anti-lock Braking System; Traction Control; Vehicle Stability Control; and Adaptive Variable Suspension.Adaptive Variable Suspension helps front and rear wheel control and provides agile, sharp and confident driving behavior with a more direct response to the driver’s actions.The LDH system monitors vehicle speed and yaw rate, steering angle and speed, and lateral G to calculate the required rear wheel steering input, to a maximum DRS angle of 2.0 degrees.At most speeds below 50 mph the front and rear wheels turn in opposite directions.In certain conditions at speeds over 50 mph the front and rear wheels turn in the same direction. As with the GS 350, the GS 350 with F SPORT package will be standard equipped with 10 airbags, including a knee airbag for both front driver and passenger.Rear seat occupants have seat-mounted side airbags, and all four outboard occupants are equipped with side curtain airbags.Also standard are new Whiplash Injury Lessening front seats designed to help limit excessive head movement, and help decrease the severity of whiplash-type injuries in certain types of rear-end collisions. Standard seatbelts with pretensioners with force limiters used for front and outboard rear seats further assist occupant protection. Available options to help further enhance occupant safety include a Pre-Collision System, which uses the Dynamic Radar Cruise Control System to provide early warning of certain objects traveling directly ahead that might result in a front-end collision. The system also uses a Lexus-first infrared camera with new scanning technology to monitor the driver’s eyes. In the event that the driver does not appear to be looking forward when a collision appears imminent, the system will initiate the warning at an earlier threshold. If the driver still does not respond and make the appropriate maneuver, the system will initiate braking intervention up to1.2 seconds prior to impact, helping to lessen the severity of the collision. With available Lexus Dynamic Handling, PCS will help further mitigate the occurrence of a collision. Other available safety systems include a Night Vision System that enhances driver visibility at night; Heads Up Display; a Blind Spot Monitor that helps detect vehicles in rear/side blind spots; and Lane Keep Assist (LKA) with Lane Departure Warning (LDW).GS is the first in its segment to offer LKA with active steering torque to provide a small amount to assist in maintaining course, while the LDW feature alerts the driver if the system detects that the vehicle is beginning to drift out of the lane. The GS fuses distinctive style with engineering functionality. The signature spindle grille with its trapezoidal contours fully integrates into the aggressive front bumper allowing for efficient airflow.Air inlets located on the outer edges of the lower grille serve as cooling ducts. This distinctive Lexus design feature combined with the deep-set, high-tech headlamps and L-shaped LED daytime running lamps further express the vehicle’s confident and dynamic character. The headlamps use a projector beam design, adding a strong, chiseled appearance and excellent illumination. Fins incorporated into the side of the tail lamps and the design of the trunk area all help direct air over and past the car. The rear bumper underbody area was designed for reduced wind resistance to help keep the car firmly planted on the ground. The GS 350 with F SPORT package will feature two new colors:Riviera Red and Liquid Platinum, and also be available in Starfire Pearl, Nebula Gray Pearl and Obsidian. Vehicles in Riviera Red will benefit from glass flakes incorporated into the coating that adds a high level of brilliance to the paint. Lexus engineers developed a new advanced coating process for Liquid Platinum exteriors. The GS 350 will be the first Lexus to adopt this new coating technology. Vehicles with the Liquid Platinum exterior will appear more radiant as an additional metallic texture gives both strong shading and defined, sharp highlights. This metallic effect makes subtle and defined bodylines more noticeable and the surface appears finely polished. To complement the aggressive-looking exterior of the F SPORT package, the interior will feature an exclusive design treatment with smooth striated aluminum trim, unique perforated leather trim, black headliner and aluminum pedals.Distinctive F SPORT badging will be showcased on the steering wheel.Focusing on the driver, the F SPORT package will feature a new 16-way power sport seat for increased lateral support. The driver’s seat will include a Lexus-first with power side bolsters, thigh support, adjustable seatback and four-way lumbar.To complete the uniqueness of the F SPORT package, a striking Cabernet Red leather interior will also be available.